Fast. By people literally eating each another's flesh, organs, and blood. This has been found both in so-called 'civilised' cultures and tribal cultures. Slow. By people slowly 'drinking' the life out of each other, e.g. exploitation. This happens over years and decades where people become economic, religious, and political prey. Guru Nanak Dev, Raag Majh, Guru Granth Sahib, 140. Because of virtuous actions, a person is known in this world as an Angel (devta). And because of evil actions, he is known as a demon (asura).15. One day Guru Nanak and his Muslim companion Bhai Mardana were travelling through a jungle. Bhai Mardana was feeling home-sick and asked the Guru if they could go home but the Guru told him to wait a little longer. Bhai Mardana could not wait any longer and insisted on leaving right away. When Bhai Mardana persisted, the Guru told him to go if he wished. Guru Nanak sat in the thick forest and went into samadhi. Bhai Mardana while heading home got trapped by a cannibal – the demon Kauda. Kauda rejoiced in killing humans and eating them. When Kauda saw Bhai Mardana, he was happy to see a healthy young man to eat. He tied Bhai Mardana jee's legs and arms and brought him to his cave, in which he had a big pan (karaha) with oil in it. He used to fry people alive. Bhai Mardana realized his mistake of not listening to the Guru. He now sat there and started calling out to Guru for help. Bhai Mardana was thrilled to see the Guru. At the same time he pleaded with the Guru to forgive him. He begged the Guru to release him. By this time Kauda came out and lifted Bhai Mardana to throw him in the huge cauldron full of boiling oil. Bhai Mardana started screaming and pleading but the Guru kept quiet and just smiled. Kauda had not noticed the Guru. Just as he was about to throw Bhai Mardana in, the Guru came out and asked Kauda to stop. Kauda was shocked to see him there and refused to do so. As he looked at the face of Guru Sahib, he melted inside, but still he kept his composure and tried to threaten Guru Sahib. Guru Sahib had come to rescue Kauda from this miserable and evil life he had made for himself. He showered Kauda with his divine grace. Kauda felt something very strange inside him but still his ego was not letting him do the right thing. 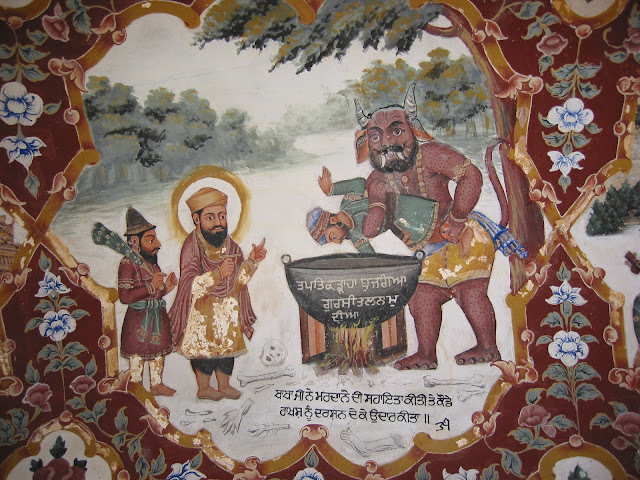 He threw Bhai Mardana in the cauldron full of hot burning oil. Bhai Mardana screamed but did not feel anything. Kauda was surprised when he noticed that the oil in the cauldron was cool. He immediately knew that it was a miracle of the Guru. Kauda, whose conscience was dead with heinous crimes, suddenly came to realization and was overwhelmed with repentance. Guru ji said, "Give up your cruel way of life. Take a vow not to harm anyone. Be kind and merciful. Help and serve others." The very gracious and holy sight of the Divine Master made Kauda realize his guilt and he fell on the feet of the Master once again and prayed for mercy. The gracious Master blessed him with Naam. (The Divine Name). Kauda promised to live and act as advised by the Guru. From a killer and eater of men he became a servant and teacher of men. Before we judge anybody as a lost cause or consign them to hell in our own mind. Let us remember the story of Kauda, who from demonic actions became an Angel. Let us not be victims or abusers, let us not drink another's blood fast or slow. We must carry on the legacy of Guru Nanak, to put those who are lost back to the middle path, and give peace and help to their victims. Says Nanak the name of the One is uplifting in whose will is compassion for all. Nanak naam chardikalah tere bhane sarbatt da bhalla.